How will El Niño effect Base Metals Market this year ? El Niño has arrived, according to a report released by the National Oceanic and Atmospheric Administration (NOAA) in early March. El Niño is the warm phase of the El Niño Southern Oscillation (commonly called ENSO) and is associated with a band of warm ocean water that develops in the central and east-central equatorial Pacific (between approximately the International Date Line and 120°W), including off the Pacific coast of South America. El Niño Southern Oscillation refers to the cycle of warm and cold temperatures, as measured by sea surface temperature, SST, of the tropical central and eastern Pacific Ocean. How will El Niño effect Metals Market this year? “Extreme weather related to El Niño, such as floods or droughts, will be a big threat to production in world’s major metal producing countries, including Chile, Peru, Indonesia. Supply disruption resulting from this will boost the market,” said an analyst from COFCO Futures in SMM interview. Another analyst from Guosen, however, expects the impact on metals market to be indirect, saying the disruption on production in major producing countries remains to be seen. But, he adds that copper price will likely stage a rally in 2Q. Foreign investors generally expect a boost on the market from El Niño, especially copper and nickel prices. (Reuters) - The London Metal Exchange (LME) announced new rules and proposals on Monday aimed at slashing delivery backlogs at its global network of warehouses twice as quickly as under current reforms. The move is part of a wide-ranging reform drive sparked by consumer complaints about long delays to obtain aluminium from storage and lawsuits accusing banks and commodity companies of conspiring to restrict supply through the warehouse network. The LME, the world's oldest and biggest market for industrial metals, also said in a statement it planned to launch new contracts for aluminium premiums and ferrous products on Oct. 26. The LME launched consultations last November on a second layer of rules governing physical delivery and on Monday it requested even more feedback on further measures. The exchange asked members for their opinion on proposals that would force warehouses to reduce queues faster. The 137-year old LME won a major court battle in October, giving it the green light to implement its initial set of regulations on Feb. 1 aimed at cutting delivery queues to a maximum of 50 days from up to two years at some depots. On Monday it said was now responding to complaints that under the current reform it may take as long as four years to cut backlogs at the worst affected site -- the Dutch port of Vlissingen. Under the new tougher rules, it would take a maximum of 2.3 years to reduce queues to 50 days, Matt Chamberlain, LME head of business development, told a news conference. "So in this example, the rate at which queues will fall would double -- the queues would last half as long." The exchange, owned by Hong Kong Exchanges and Clearing Ltd , also set a firm October date for the launch of three new contracts: aluminium premiums, steel scrap and steel rebar. The aluminium premium contract, which allows people to hedge additional surcharges for buying metal for immediate delivery, has been delayed from a second quarter launch. This was because the LME first wanted to conclude any further warehouse reforms, which could have had an impact on premiums, Chamberlain said. The exchange also released a discussion paper on the possibility of capping or banning rents in queues. Buyers of metals have complained about having to pay high rent during the months that metals were stuck in backlogs waiting to be delivered from warehouses. Previously the LME has rejected the idea of setting rent levels at warehouses, saying it had legal advice that it might fall foul of competition law. The exchange published a detailed set of new rules on Monday to take effect on June 1, one of which will require warehouse firms to report anonymously incentives paid to metal owners so it can determine whether those payments were market distorting. (Reuters) - Copper fell to a three-week low on Wednesday after soft U.S. economic data and as Chinese speculators hit the market amid worries about weak demand. Aluminium, however, gained on concern about shortages. (LME) fell to its lowest since Nov. 5 at $6,558 a tonne in intraday trade before paring losses to close 0.6 percent weaker at $6,570. Volumes on the LME shrank ahead of the U.S. Thanksgiving Day holiday on Thursday. "It has been a difficult year for speculators to make money and I don't think they are going to risk making bigger losses or eroding some of their gains in the final few weeks of the year, particularly when there aren't really any big stand out stories," said Gayle Berry, metals strategist at Jefferies. On the Shanghai Futures Exchange, however, turnover climbed four-fold and open interest surged 11 percent as speculators sold copper, said analyst Leon Westgate at Standard Bank. "With general sentiment at last week’s Asian Copper Week remaining negative... it appeared to be only a matter of time before the more bearish elements of the Chinese speculative community again had another go at shorting the metal." The metal used in power and construction has been trading in a range between roughly $6,500 and $6,800 a tonne since mid-September and is down more than 10 percent this year. It hit a three-week high of $6,772.50 a tonne last week following China's surprise interest rate cut. That cut may boost liquidity to businesses after about six months, said Colin Hamilton, head of commodity research at Macquarie. "This is not an aggressive stimulus ... but it certainly underpins what we're looking at in terms of low single-digit growth rates for steel demand and mid single-digit growth rates for base metals demand into next year," he told a presentation. Weak U.S. data on consumer and business spending added to jitters about global growth. Aluminium rose 0.6 percent to close at $2,061 a tonne as a key spread remained at the highest levels in nearly two years, indicating lack of spot material. Nickel ended down 1.1 percent at $16,350 a tonne after LME stocks rose to a fresh all-time high. Zinc finished up 0.1 percent at $2,273 a tonne, lead added 0.5 percent to $2,062.50 and tin rose 0.4 percent to close at $20,275. China's consumption of refined copper is expected to rise at least 6 percent in 2015, roughly in line with this year, supported by new investment in power networks and demand from rail projects, analysts and industry executives said. An expected slowdown in new residential and commercial building projects, however, could see an easing in consumption growth for aluminium and nickel in the world's top metals consumer. Lead demand growth may also be trimmed by lower production of electric bicycles, while tin demand should be supported by chemicals and tin-coated steel plates makers. China is expected to complete power network orders from its 2014 power plan next year, as well begin a new investment plan for 2015, said a senior executive at a state-owned copper producer. The power sector is the country's top copper user. Investment in new power networks had been expected to rise more than 10 percent in 2014 fell 0.6 percent in the first half from a year earlier, raising expectations that more orders would be placed between the fourth quarter and early next year. "In China, big (infrastructure) projects usually are started in the third year of a government. Next year is the third year to the current government," said the executive, who declined to be named because he was not authorised to talk to media. Rail project orders for power cables and wires have risen since August and could stay strong next year, said a manager at a large end-user of refined copper, who put consumption growth at more than 7 percent next year. This was above a forecast from state-back research firm Antaike, which put consumption growth at about 6 percent in 2015, compared to an expected 6.7 percent-rise to 8.75 million tonnes this year. Growth could be capped by a fall in demand from air-conditioners makers next year after they raised the output in 2014, said Yang Changhua, senior analyst at state-backed research firm Antaike. China's still healthy demand rise could help copper prices on the London Metal Exchange , three industry sources said. A trader at a Chinese hedge fund expected the average LME copper price to rise 5 percent next year from 2014. New property projects, which typically consume copper, aluminium, zinc and nickel, are likely to slow next year, even though banks have relaxed lending to some house buyers in the past month, cutting existing stocks, metal industry sources said. For aluminium, demand from transport and power transmission may rise next year, said an executive at a state-owned smelter said, who asked not to be named. Overall consumption of primary aluminium is likely to rise 7-9 percent next year from about 10 percent expected in 2014, said the smelter executive and Wang Chunhui, analyst at information provider SMM, who put consumption at 27 million tonnes in 2014. Production of primary aluminium may rise about 10 percent to 30-31 million tonnes next year due to new capacity. High output and lukewarm demand may boost exports of semi-finished products. A drop-off in new property projects could also affect demand for zinc and nickel, which are used to coat some steel products for the building sector. Zinc is also widely used in infrastructure projects such as power networks and transport. Antaike expects China's refined tin demand to be flat this year, at just above 150,000 tonnes, and to rise slightly next year due to steady demand from chemicals and tin plated steel products used for packaging. It expects China's refined lead consumption to rise 4 percent to about 5.1 million tonnes in 2015 from the year before, compared with a 5-percent rise for 2014 as production of electric bicycles starts to drop after a rapid rise in the past few years. Bank of America Merril Lynch in a research note published Wednesday forecasts bullish 2015 for base metals, backed by structural improvement of market fundamentals. The report also states that macro-economic pressures led to substantial retracement in prices of some base metals during summer this year. According to the report, cyclical headwinds continue to exist for the time being. However, early signs of structural improvement in fundamentals are already visible in individual base metals. Aluminum market fundamentals are looking strong with the metal expected to shift to deficit in 2014. Bofa ML forecasts aluminum price to reach $2,010 per mt in 2015. As for Nickel, the supply-demand situation may turn out to be extremely bullish through 2015. Higher Chinese refined and ferronickel imports and declining LME stocks may trigger further strengthening of market fundamentals for the metal. Nickel is expected to end in a deficit of nearly 50,000 mt in 2015, BofA notes. The Nickel prices may average at $23,836 per mt in 2015. 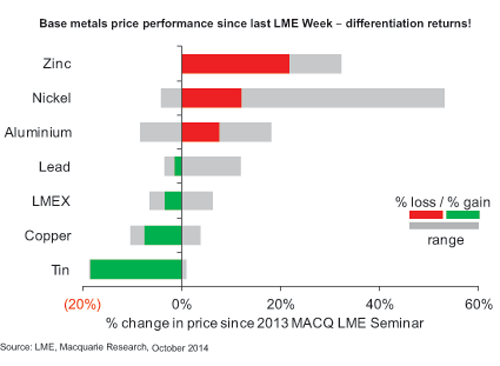 According to BofA Merril Lynch, copper still has the weakest fundamentals among base metals. China has de-stocked huge inventories of copper during summer, resulting in lower imports. But with copper inventories at substantially lower levels, the bank forecasts rebound in copper prices during 2015. The LME copper prices are likely to average at $6,939 per mt in 2015. Copper is expected to average $6,500 a ton during next year while aluminum to average $2,060 a ton, said BNP Paribas. Except for copper , all of these forecasts are above current prices for three-month metal on the London Metal Exchange. The French bank’s 2015 average price forecasts for the other base metals are lead at $2,365 a ton; nickel at $22,100a ton; tin at $24,000 a ton and zinc at $2,560 a ton. Mounting supply constraints and respectable demand growth should provide increasing support for most base metals in 2015. “The constraints remain greatest among the smaller metals. 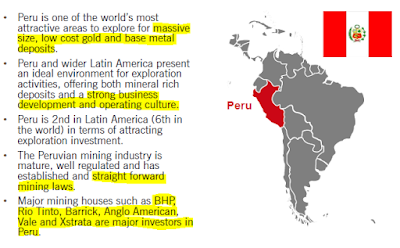 In particular, the bank says, supply constraints in lead, tin and zinc will become more pressing in 2015,” BNP Paribas added. Nickel’s outlook remains entirely in the hands of Indonesian policy and still looks positive as things stand, BNP Paribas said, referring to a ban on ore exports. Aluminum continues to face a large structural surplus, but non-Chinese producers are addressing this and China could start to experience raw material shortages. In contrast, BNP Paribas still expects firm supply growth to keep the copper price under pressure until deep into 2015. 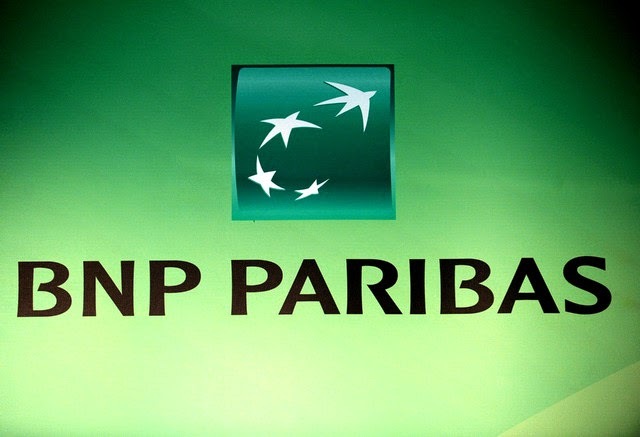 BNP Paribas maintains its recommendation of a short copper trade versus a basket of other base metals. Societe Generale sees a mixed outlook for base metals as a Chinese economic slowdown impacts metals differently, listing itself as most constructive on nickel. Base metals have been on the defensive since summer, hurt by slowing growth in China, the eurozone and US, perceptions of a more hawkish Federal Reserve and other factors. SocGen is sticking to their view that increasing copper mining output, which is now well under way, will over time ease the current tightness in the refined market. While global copper consumption growth is expected to strengthen this year helped by moderately higher global economic growth, serious structural oversupply in China's housing sector and tightened credit conditions are likely to cap both Chinese and global copper consumption growth. There is scope for the other metals to rally to varying degrees on tightening markets coincident with seasonal demand strength typically associated with Q4. However, as ever, much will depend upon China. SocGen is most bullish towards nickel. While the refined nickel market remains well supplied at present, this is likely to change from next year. The nickel market has changed dramatically as a result of Indonesia's ban on nickel ore exports, which SocGen expects to be enforced. This one factor alone is likely to shift the nickel market from structural oversupply to a balanced outcome this year, with sizeable deficits probable over the coming years. What to expect from Base Metals market in October ? 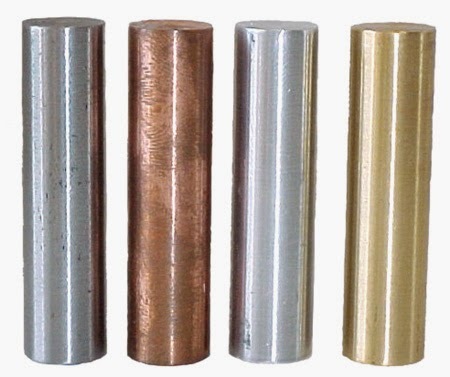 It is a traditionally peak demand period for base metal market in September and October. However, market conditions did not get improved over the past September. 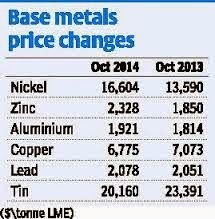 Will base metal market improve in October after high consumption failed to materialize in September? “At the macro front, the Chinese story is not a great one for base metal market”, said an analyst from COFCO Futures, citing the sluggish property market and the lack of fresh stimulus measures. A strengthening dollar will also put a downward pressure on base metal market, he added in SMM’s latest interview. “Market fundamentals, however, will paint different pictures for different products”, he added. 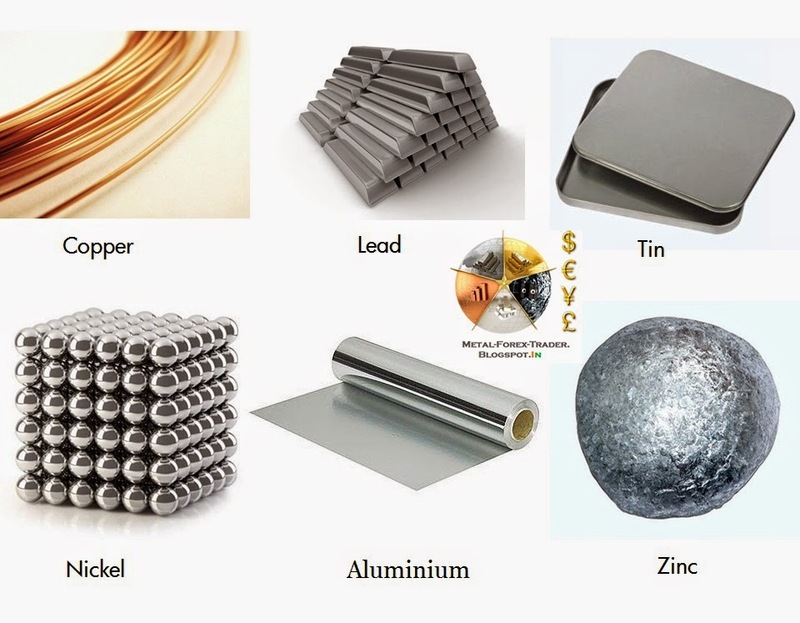 The copper market will see supply pressures growing in response to capacity expansion and high TCs, and this will send copper prices lower, while possible supply disruptions in aluminum and zinc market will help support the two markets, the zinc market in particular. The geopolitical risks are escalating now, sending the US dollar index up to a 10-month high. Concerns over global credit risks also combine to shadow the market. As a result, the global commodity market fell across the board. Base metal prices, however, succeeded to find support at key levels. “If prices fall below those key support levels ( copper 7,030-7050; aluminum 1,980-1990; zinc 2,340-2350; lead 2,230-2240), cash will fly away from the market, and this will trigger bigger losses”, one analyst said. He added that prices will fall back from initial highs as the second half of 2014 goes on. Shanghai Metals Market expects base metals to follow divergent trends this week, but optimistic expectations surrounding upcoming economic releases should favor some prices trending up. China’s State Council issued guidance on reform of the household registration (“hukou”) system July 30. The proffered guidance indicates that household registration restrictions will be abolished in towns and smaller cities first. 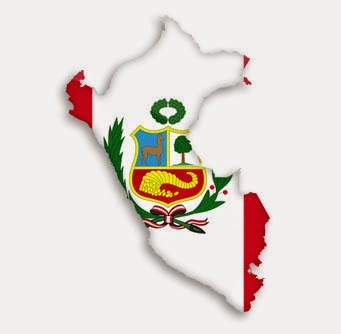 The government also indicated that it would loosen residence registration requirements in mid-sized cities “in an orderly manner”, while a points system will be established to control the number of migrants moving to cities with populations over 5 million. Reform of the household registration system is expected to boost infrastructure construction, as well as consumption of medical care, education, cars, home appliances, and housing in general. That, plus increased investment opportunities, should bolster demand for metals. Analysts estimate reform of the household registration system to contribute 5% to GDP growth over the next six years. The US Federal Reserve agreed to cut bond purchases another USD 10 billion/month after its two-day policy meeting for July, but offered no clearer indication as to when it might raise rates. Although the Fed acted calmly after US Q2 growth proved brighter than expected, it did express greater optimism over the labor market and inflation. This upbeat assessment may help bolster the market. Shanghai metals price is expected to lurch higher today following the surprisingly high HSBC PMI reading for July, Shanghai Metals Market foresees. The HSBC flash China manufacturing PMI rose to 52 in July, an 18-month high, well above market expectations. 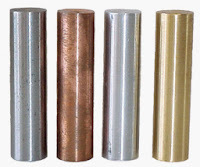 The result helped copper , being refrained from rising, lead the gain among base metals. The bullish sentiment in zinc and aluminum market should remain unchanged. Companies have struggled to export minerals from Indonesia since harsh regulations were put in place in January, creating a supply squeeze for nickel . However, two companies have now opted to start paying newly required export taxes in order to ship mineral concentrate. Reuters reported Friday that Sebuku Iron Lateritic Ores (SILO) and Lumbung Mineral Sentosa have secured permits to ship iron ore , zinc and lead subject to a 20-percent export tax. Currently, that tax is slated to increase incrementally to 60 percent in the latter half of 2016. Indonesia implemented new rules banning the export of mineral concentrates in order to pressure miners to refine metals domestically. SILO has now shipped 100,000 tonnes of iron ore concentrate, while Lumbung has sent 8,000 tonnes of lead and zinc concentrate out of the country, according to the news outlet. R Sukhyar, Indonesia’s coal10 and mineral director-general, stated, ”they finally wanted to pay it,” in reference to the tax. Indonesia’s new mineral export regulations have also been making waves in the copper space as major miners Newmont Mining (NYSE:NEM) and Freeport-McMoRan Copper & Gold (NYSE:FCX) have so far been unable to come to an agreement about the rules with the Indonesian government. Reuters said in another Friday article that Newmont may even risk losing its mining license to a state-run miner as Indonesia is prepared to defend its case in international court. However, as Nickel Investing News has previously explored, the Indonesian ban is not the only factor at play for the metal. Russia’s Norilsk Nickel (MCX:GMKN) is the world’s single largest nickel producer, and it also influences the market. Kitco News reported last week that although increasing sanctions on Russia have yet to affect the metals producer, another increase in sanctions last week renewed supply fears on worries that Norilsk will eventually be affected. For now, of course, ban has yet to be lifted, and any exports from Indonesia will remain subject to hefty tariffs. In that light, nickel investors may want to keep an eye on the situation in the island nation, as well as nickel-focused companies operating outside of Indonesia and Russia. North American Nickel (TSXV:NAN) currently has two exploration projects: a nickel-copper-cobalt-PGMs project in Greenland and a copper-nickel-PGMs project in Ontario, while PolyMet Mining (TSX:POM,NYSEMKT:PLM) and Duluth Metals (TSX:DM) are both exploring for polymetallic deposits in Minnesota’s Duluth Complex. Polymet is advancing its wholly owned, advanced-stage NorthMet nickel-copper- precious metals project, while Duluth is focused on its Twin Metals copper-nickel-cobalt-platinum-palladium- gold - silver project. Additionally, Balmoral Resources (TSX:BAR30) is assessing the base metal potential of its Grasset gold discovery in the Abitibi greenstone belt. Follow-up drill testing intersected a previously unknown occurrence of nickel-copper-PGMs mineralization grading 0.5-percent nickel, 0.1-percent copper, 0.33 grams per tonne palladium and 0.15 grams per tonne platinum. Indonesia has ended the six month ore export ban and has restarted the exports by taking new policy to improve the returns on the shipped out resources from the largest economy of Southeast Asia, said a mining ministry official. 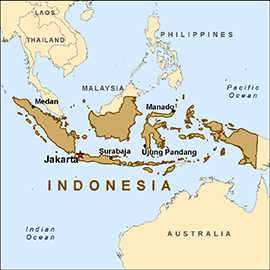 Indonesia has imposed a ban on unprocessed metal ore exports in January and as a part of the policy to force the miners to construct domestic smelters for processing the minerals, they have levied an escalating tax on the mineral concentrate exports. Disputes followed by the export ban stopped the monthly export of about $500 million minerals and concentrates. Before the imposition of the ban, Indonesia was the major exporter of nickel ore, iron ore and aluminium ore.
Coal and Minerals Director General, Sukhyar told that last week ships with iron ore, zinc, and lead concentrate left the nations amid the disputes, after two companies agreed to pay a 20 percent export tax. The two firms are Sebuku Iron Lateritic Ores (SILO) and Lumbung Mineral Sentosa. SILO has shipped about 100,000 tonnes of iron ore concentrate where as Lumbung has shipped about 8,000 tonnes of lead and zinc concentrate. Sukhyar added by referring to the escalating tax that finally the companies wanted to pay it. The export tax has even made a legal dispute with the U.S miner Newmont Mining Corp.
SILO anticipated to ship about 8 million tonnes of iron ore concentrates per year where as Lumbung would export about 29,000 tonnes annually. The two companies are exporting the ores to China. What are the factors to drive base metals this week? A series of economic data will be due this week, and with strong speculative activities, base metals prices will each continue down recent trendlines, as per major Chinese analysts. The National Bureau of Statistics (NBS) shows that China’s GDP grew at an annualized 7.4% in 1H, as Q2 growth accelerated to 7.5% (annualized), said Shanghai Metals Market. China has undertaken small stimulus measures – including infrastructure investments and adjustments to bank lending ratios – leading to June’s rise in fixed-asset investment. Investment contributed less than 3.6 percentage points to H1 growth, below the 4.1 percentage points from consumption. But, current growth remains heavily dependent on government-driven consumption, which has served to counter slides in manufacturing and real estate, but at the price of a spike in lending. New lending in June outpaced the previous three months. China will maintain a pro-growth posture into 2H. A series of measures are expected to expand the money supply – including tax cuts and increased capital lending – to counter a steep drop in forex receipts. The PBOC is also likely to cut deposit reserve ratios for all financial institutions after a recent targeted cut. Nevertheless, China’s economy continues to face pressure from the lack of domestic demand and a sluggish real estate sector.